Merriam-Webster spells it in the closed-form nonionic. On the other hand, Oxford spells it in the hyphenated form non-ionic, while also providing the closed-form nonionic as being US English. So, if you go by the dictionaries (or by a style guide that says to use a regional dictionary), use nonionic for a US audience and non-ionic for a UK audience. 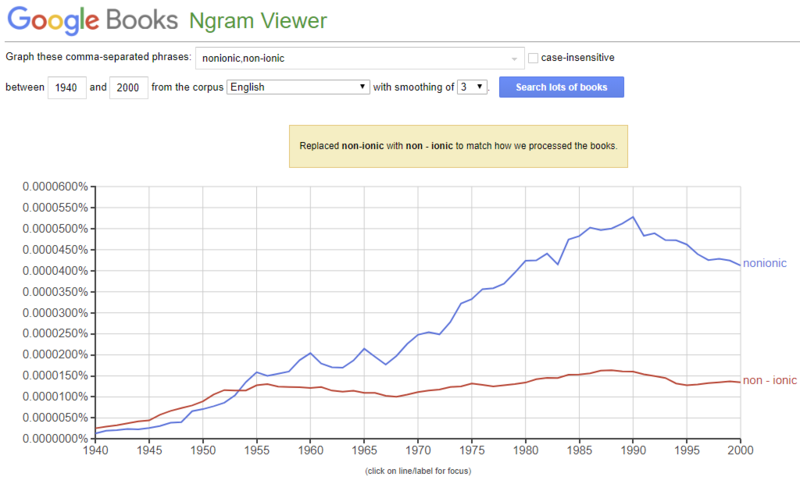 Having said that, although the British corpus on Google Books Ngram Viewer shows that non-ionic is slightly more common in print in general, between 1989 and 1998 (for some reason), nonionic was actually used more often. Not the answer you're looking for? Browse other questions tagged hyphenation prefixes negative-prefixes or ask your own question. Non-sea salt sulfate or non-sea-salt sulfate?